Produced by:- K9 Films Pvt. 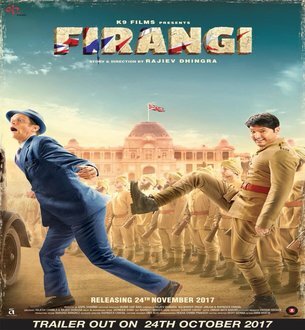 Ltd.
Firangi is an Upcoming Bollywood Film in 2017, It is Comedy Drama Film and Kapil sharma, Ishita Dutta in lead roles. This film is Directed by Rajiv Dhingra and Produced by K9 Films. It is made under the banner of Grewal Gurinderpal Lalton. Firangi is scheduled to release on 24 November 2017. The story of the film is from 1920. The film shooting is mostly done in Rajasthan. As of month March 2017, Film release date has not been announced. Kapil Sharma has been heard promoting about Firangi many time in The Kapil Sharma Show. Kapil Sharma is doing great work for this film. At times, he has posted many photos of his own exercise on social media. For this film, he is losing his weight by taking special training.